As a result of the explosion in the Syrian city of Essaouida, up to 100 people were killed. 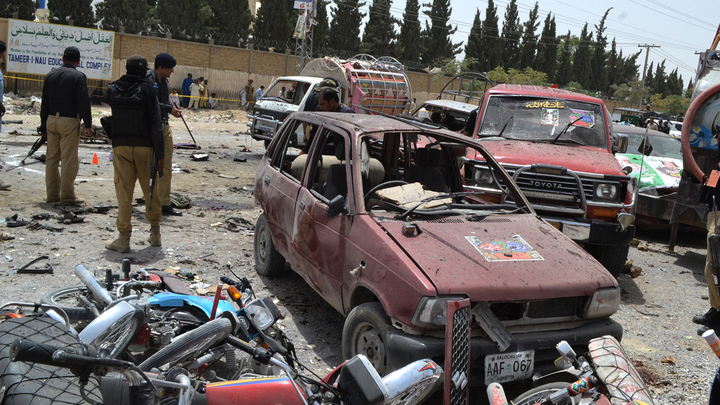 Today, another terrorist attack took place - in Pakistan, and a day earlier in Afghanistan. Why the massacre of civilians in the Middle East is not widely covered in the media? When it comes to geopolitics and influence, everyone is talking in chorus about the oil-rich Middle East. The United States has several "strong points" here, for example, in Bahrain their Fifth Fleet is based, and in neighboring Qatar there is the largest military base in the region. Of interest are the former European metropolises - Britain and France, which conduct military operations in Syria and Iraq against the Islamic State, and help the Kurds. Germany and Italy are connected to them. Russia since 2015 is in the thick of events and is fighting on the side of Syrian President Bashar Assad against the militants. The geopolitical appeal of the Middle East makes it both the most bloody. However, the media are more interested in the truck raids on the crowd in Stockholm, the attacks on Charley Ebdo in Paris and other terrorist attacks in Europe.then in deaths of the people from the region. Today, during the attack of the Islamic State Guards, about 100 people were killed and another 176 people were injured in the city of Essaouira, which was under the control of the Syrian government. The analysis of causes and context is a topic for a separate analytical article. The very fact of the terrorist attack and the number of victims are important here. On the same day, in Pakistan, where parliamentary elections are held, 28 people were killed from the attack by militants. A day earlier, an explosion, arranged by terrorists near the airport of the capital of Afghanistan, killed 16 more people. The country's vice-president Abdul Rashid Dostum, who was there shortly before the attack, miraculously escaped death. What is Western media talking about at this time? Trump's "tariff war" the death of Fiat's manager Sergio Marchionne, football racism in Germany, the Catalan separatist Puigdemone and many other "important" news. From this we can draw a simple conclusion. The Middle East is interesting only when it comes to oil, gas and military operations. The life of a Syriac, an Afghan or a Pakistani is worth nothing for the American and European media. Although, when even a few people die in the Old World, everyone declares a "breaking news " and rushes to watch, sympathize, or declare mourning with the painting of famous buildings in the colors of the flag of the affected country. According to all known religions and even atheistic humanism, which journalists are often guided by, people are equal before God and among themselves. Therefore, according to all the canons of morality - it's a real hypocrisy to mourn for a pair of Europeans and indifferently ignore the deaths of hundreds of Syrians. Someone can argue that the European and American readers are not interested in the dismantling of the "wild peoples" of the East. But this is a huge error. The media form public opinion. And it's mostly their fault that people spit on their counterparts in Iraq, Yemen, Pakistan and Syria. Why not paint the Brandenburg Gate, the Eiffel Tower or the White House in the colors of the Syrian flag today?